KML layers are defined using the XML-based Keyhole Markup Language, which is designed to store geographic data. Many mapping applications support KML, including Google Earth, Google Maps, and ArcGIS Server. For more information, see the Open Geospatial Consortium's specification for KML. To add a KML layer to an Essentials site, the file must have a .kml or .kmz file extension. In addition to adding KML layers to a site, sites can inherit KML layers from web maps. By default, Essentials uses a KML utility service provided by ArcGIS.com to process KML layers. This requires Internet access. If your system does not have access to the Internet and you have Portal for ArcGIS, you can configure Essentials to use the KML utility service that is hosted by Portal for ArcGIS. For instructions, see Override the Default KML Utility Service. In Essentials, KML layers have a map service component, but no layer component. If the KML definition contains folders (<Folder> elements), the folders show on the Layer List tab in Manager, but they do not show on the Map Services tab or in layer themes. You cannot edit KML folders or change their visibility in Manager; however, end users can turn the visibility of KML folders on and off in the viewer. Map tips display the balloon (<BalloonStyle> element), if one is defined. If a balloon is not defined, then map tips display the <description>. You can use the Snippet in map tips instead of the <description>, if you want. Similarly, the Results List displays the <description>, or you can use the Snippet in the Results List instead. Essentials does not validate the KML Service URL. If your KML service is not configured properly or is missing, and the viewer cannot connect to the utility service hosted at ArcGIS.com, KML layers do not appear on the map. 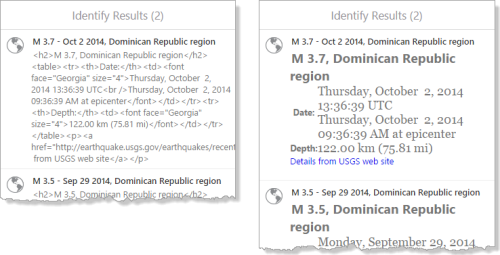 By default, viewers display the value of a KML feature's <description> element in the Results List and in map tips. KML <description> elements can contain HTML markup. For an HTML5 viewer to render the markup, the viewer's Allow Unsafe Content setting must be enabled. If Allow Unsafe Content is disabled, end users will see the markup, instead of what the markup represents. If you use the <Snippet> element instead of the <description> element in the Results List and map tips, you do not need to enable HTML rendering, because the <Snippet> element cannot contain HTML markup. See Use a KML Layer's Snippet Element in a Viewer's Results List and Use a KML Layer's Snippet Element in a Viewer's Map Tips. Enabling HTML rendering in a viewer enables HTML rendering for all of the KML and GeoRSS layers in the site that the viewer belongs to. In Manager, edit the viewer that you want to configure—edit the site that the viewer belongs to, click Viewers in the side panel, and then click the Edit icon beside the viewer. In the side panel, click Application. Select the Allow Unsafe Content checkbox. By default, HTML5 viewers display the value of a KML feature's <description> element in the Results List. You can configure an HTML viewer to display a KML layer's <Snippet> element in the Results List, instead of the <description> element. In the side panel, click Look and Feel. In the Results List area, select Feature Description from the Content Field drop-down list. By default, HTML5 viewers display the value of a KML feature's description element in map tips. You can configure an HTML viewer to display a KML layer's Snippet element in map tips, instead of the description element. In the Map Tips area, select Feature Description from the Content Field drop-down list. You need to process KML layers that are not publicly accessible from the Internet. Your viewer cannot access the Internet. If you use Portal for ArcGIS, you can set the KML Service URL to use its built-in KML service. In Manager, edit the site that you want to configure, and then click GIS Services from the side panel. Specify your KML Service URL. A typical Portal for ArcGIS installation's KML service URL is http://your.portal-domain.com/arcgis/sharing/kml.